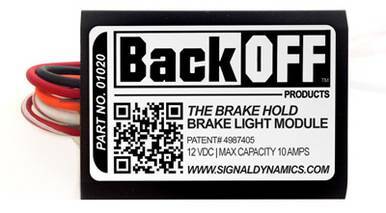 Brake Light Modules - AdventureTech, LLC. Note for International Customers: Insurance and delivery confirmation is required for these items. International customers should contact us for shipping quotes using Express Mail. 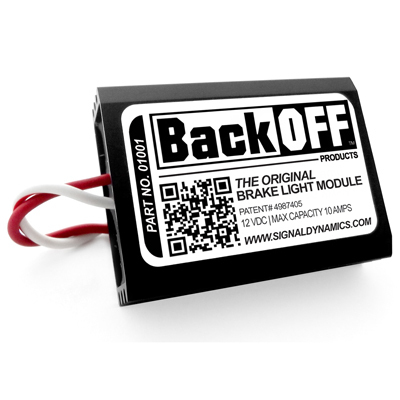 The BackOFF™ Brake Hold Brake Light Module detects your speed and automatically turns your brake lights on when you are stopped or stopping/slowing down - allowing you to keep both of your feet and hands free. 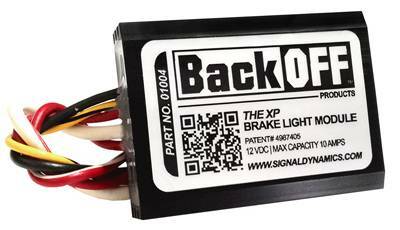 The BackOFF™ XP Brake Light Module automatically flashes your brake light(s) to capture the attention of following drivers and to make your motorcycle more visible. When installed, the motorcycle's brake light becomes significantly more noticeable with your choice of 2 attention getting patterns. Work with standard incandescent, LED, or a combination of both (up to 10amps). The AYN is All You Need! AYN stands for all you need, because this license plate frame and smart module combination pack will give you just that!